Back by Popular Demand! Movies at the Soo Theatre! Since more than 400 people attended The Rocky Horror Picture Show on October 17, we decided to bring you more of what you've been asking for: movies at the Soo Theatre! For five weekends from Halloween through Thanksgiving, the Soo Theatre Project will present some movie classics on the big screen to celebrate the season at an affordable price. Admission is just $5. Want to know more about a movie? Check the Movies at the Soo Theatre page on our website at sootheatre.org for links to movie trailers. Saturday, October 31 (Halloween night) at 10 p.m.
Sunday, November 1 at 2 p.m.
Friday, November 6 at 7:30 p.m. and 9:30 p.m.
Saturday, November 7 at 7:30 p.m. and 9:30 p.m.
Sunday, November 8 at 2 p.m.
Friday, November 13 at 7:30 p.m. and 9:30 p.m.
Saturday, November 14 at 4 p.m. and 7:30 p.m.
Friday, November 20 at 7:30 p.m.
Saturday, November 21 at 4 p.m. and 7:30 p.m.
Sunday, November 22 at 2 p.m.
Saturday, November 28 at 4 p.m. and 7:30 p.m.
Sunday, November 29 at 2 p.m.
Don’t forget, the Soo Theatre’s Haunted Hall will be open on Friday, October 30, during the 16th Annual Fall Festival, Safe Trick or Treating from 5:00-7:00 p.m. Hosted by the Sault Ste. Marie Downtown Business Association, the festival also includes free hayrides and a children’s carnival, winding up with a kid’s costume contest at Avery Square at 7:00 p.m. You’ll have a great time at the Haunted Hall, so make sure to stop by and enjoy this free event! The Soo Theatre Project is located at 534 Ashmun Street in Sault Ste. Marie, Michigan 49783. For further information, call the theatre at (906) 632-1930 or visit our website at www.sootheatre.org. Come, join, and support the Soo Theatre Project! With your help we can continue to improve your theatre experience! Movies Return to the Soo Theatre Saturday, October 17! The Soo Theatre Project is pleased to announce the return of the genre you've all been waiting for: Movies! 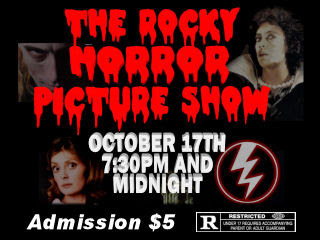 Just in time for the Halloween season, we will show the cult classic, The Rocky Horror Picture Show, on Saturday, October 17. A landmark event, this will be the first movie shown at the Soo Theatre in ten years. This 1975 British musical comedy film parodies science fiction and horror films. Still in limited release nearly 34 years after its premiere, it has the longest-running theatrical release in film history. The movie is about a newly engaged couple who have a flat tire and go to a nearby castle to ask for assistance. Little do they know that they have stumbled upon a crazy household of aliens who are involved in some very odd situations and creations. The movie will be shown at the Soo Theatre for one night only, Saturday, October 17th. There will be two movie showings, one at 7:30 p.m. and one at midnight. The 7:30 p.m. showing will just be the movie and the midnight showing will feature an interactive performance by members of the LSSU Dance Company. Kits will be available for the midnight showing. Tickets are just $5 and are available in advance or at the door at the Soo Theatre, 534 Ashmun St., in Sault Ste. Marie, Michigan. For further information, call the theatre at (906) 632-1930 or visit our website at www.sootheatre.org. The Rocky Horror Picture Show is rated R - Restricted - Under 17 Requires Accompanying Parent or Adult Guardian. P.S. Look for more movies at the Soo Theatre in 2010! 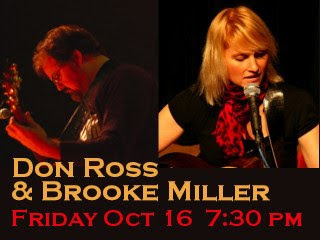 Don Ross and Brooke Miller Return Friday, Oct 16! The Soo Theatre Project is proud to present Don Ross and Brooke Miller, the legendary solo guitarist and one of Canada’s finest new songwriters together in concert, as they return to the Soo Theatre stage Friday, October 16 at 7:30 p.m.
One of today's true innovators of guitar composition and technique, Don Ross has emerged as one of the most respected musicians in Canada and one of the top guitarists in the world. Noted for the emotion and intensity of his playing as well as his technique, his music borrows from blues, jazz, folk, and classical music, creating a style that he describes as "heavy wood". Brooke Miller hails from Prince Edward Island on Canada's Atlantic coast. Once a punk band singer that had opened for such bands as Modest Mouse and Sloan, she soon outgrew the three-chord confines of punk and began exploring more sophisticated and challenging techniques and genres--from the intricacies of finger-picking to the more colorful palette of jazz. Today her music reflects the more refined simmering that only a few years and intense devotion to both perfecting serious craft and living meaningful life can bring. The Soo Opera Theatre announces auditions for Amahl and the Night Visitors by Gian Carlo Menotti. This one act vocal work tells a heartwarming story of a crippled boy named Amahl (Boy Soprano) and his mother who are visited by three kings (Tenor, Baritone & Bass) on their way to Bethlehem. They are also visited by the shepherds (SATB chorus) and a lovely dance piece is included in this work. The production will be directed by Dave Rhinard of DeTour and Karen Hughes of Pickford. Amahl and the Night Visitors will be performed in Cedarville Dec. 3rd, 4th, and Dec. 6th in Sault Ste. Marie. The casting for Amahl and the Night Visitors are: One boy soprano in the role of Amahl (Age 10-12); Kaspar, a king – Tenor; Melchior, a king – Baritone; Balthazar, a king – Bass baritone; A Page – Bass; SATB Chorus of all ages, and 10-12 Dancers. Auditions are Sunday, October 4th 2:00-4:00 at Cedarville High School and Monday, October 5th 7:00-9:00 at Soo Theatre Project in Studio D.
Soo Opera Theatre presents Amahl and the Night Visitors by Gian Carlo Menotti performed in Cedarville Dec. 3rd, 4th, and Dec. 6th in Sault Ste. Marie. For additional information please contact the Soo Theatre Project at (906) 632-1930 or www.sootheatre.org. Soo Theatre Project, 534 Ashmun Street, Sault Ste. Marie, MI 49783. You may also contact (906) 647-8101. Come, join, and support your local arts by auditioning for this heartwarming tale!